Maybe it's Pennsylvania's proximity to New York that has kept the state under wraps as one of the most dazzling places to visit in the Northeast during the holiday season. In Pennsylvania, you'll discover not only the annual shows, parades and festivals that Pittsburgh and Philly are famous for, but you'll also find spectacular light displays - seemingly arising out of nowhere in the countryside to take your breath away and make family memories for a lifetime. • The centuries-old tradition of hanging Christmas trees upside down was brought to the US by Pennsylvania's German immigrants. The reason? 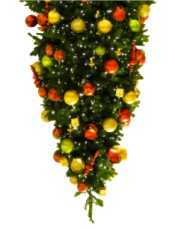 To keep the mice from eating the dried apple garland and other edible ornaments that decorated the tree. Today, the custom is making a modern comeback among space-deprived homeowners and apartment dwellers. • The not-so-little town of Bethlehem, PA has been dubbed "Christmas City" for good reason. Every year, the postmaster receives tens of thousands of Christmas cards from around the world to be stamped with a "Bethlehem" postmark for the holidays. Meanwhile, shops are decorated for the holidays beginning in November as visitors line up for special holiday carriage rides and Bethlehem By Night bus tours. • The Pennsylvania Amish community celebrates Christmas not once but TWICE each year as December 25th is observed quietly in prayer, while "Second Christmas" is celebrated on December 26th with festive gatherings and gift exchanges. Philadelphia Christmas - Check out what's going on in the city and environs with dates, times and schedules for Christmas tree lightings, Macy's Center events, holiday craft markets and lots more. American Music Theatre's Christmas Show - Discover holiday razzle dazzle with carols, holiday music, dancers and comedy sketches in this annual Lancaster holiday tradition. Check the event calendar for ticket purchase and show times. Christmas in Downtown Pittsburgh - Check the event calendar for dates & times for Light Up Night, the annual parade, outdoor ice skating and other holiday fun. Christmas at Elizabeth Farms, Lancaster County - Besides cut your own Christmas trees, it also features sleigh rides, a model train display, Bloomingdale's Holiday Window displays, and a Gift of Lights mile long drive through Christmas light displays. Jim Thorpe Olde Time Christmas - Join the fun with this annual holiday tradition including train rides, music, caroling, Christmas parade and tree lighting, historic ghost walks, and more. Overly's Country Christmas - More than 2 million lights twinkle across 15 acres at Westmoreland Fairgrounds in a dazzling annual tradition including eats and treats, a talking Christmas tree, holiday bonfire and don't miss the vintage toy collection, with maps and directions. Koziar's Christmas Village - Getting raves by visitors for almost six decades now, this unforgettable winter wonderland of lights and decorations brings Christmas to life in Bernville. With photos, maps and directions. Christmas Tree Farms in Pennsylvania - Listings with contact details and directions for Christmas tree farms near Philadelphia, Pittsburgh, and statewide including those offering seasonal entertainment, sleigh rides and refreshments. Pennsylvania German Christmas Traditions - Check out information on Old and New World Amish customs including traditional decorations and historical overviews on the origins of the "putz" (Christmas creche) and a visit by "Der Beltznickel" (Santa).